It’s your opportunity yo have a say on how the club is run, and… Free food! Two course meal provided with veggie/gluten free main available. Premier Toyota Llandudno are having a bespoke medal made, for all finishers, and our famous mug for all finishers. We also have major sponsors who will be announced shortly, these are providing cash for 1st Male and 1st Female £500, yes you read it correctly. As the 25th year of holding this event it is not to be missed. Some of you have been eagerly awaiting the Eryri Orienteers Winter Night Nav Series, and attached here are the fixtures list, starting on Thurs 3rd November, at Bethesda. 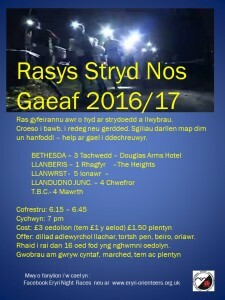 6.45pm from the Douglas Arms. Each event lasts 1 hour only and can be undertaken by singles, pairs, or even teams. They are an excellent winter training session, involving speed training, and improve your navigation sense along the way. No experience necessary. You’ll get an excellent workout, usually involving some hill work, and exercise your brain too. They all start and finish at a pub, so they’re also a great social gathering. It’s for all ages, juniors included, and they can run with seniors. The fastest runner doesn’t always win! Mold XC – Great turnout for first race of season! HUGE well done to everyone who made the trip to Mold on Saturday for the first XC of the season, brilliant to see so many people! 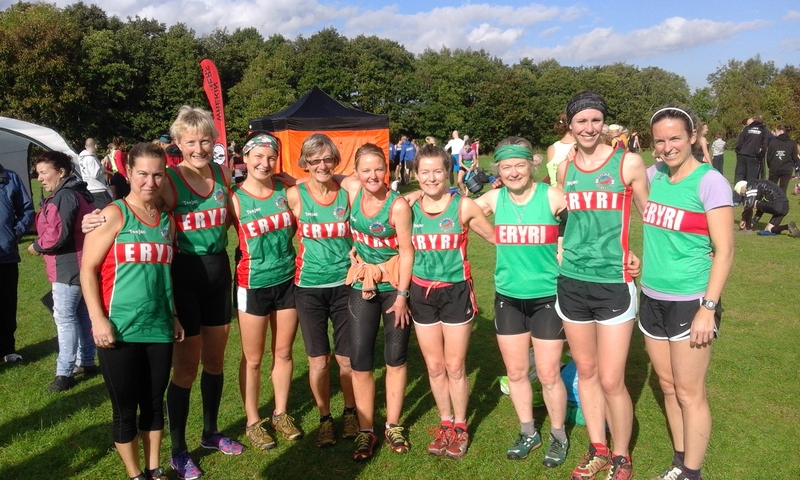 In the first race of the day, we had 9 ladies – Megan Hughes was first Eryri lady home (17th overall and 3rdW40), very closely followed by Helen Blair (18th overall and 2nd W45). Tammy Lewis-Jones was next in 28th, again closely followed by Louise Emery-Jones (30th). 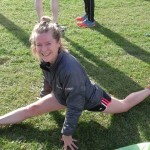 Annie Williams had a strong run and was 37th and 1stW55 (stretching is good for you! 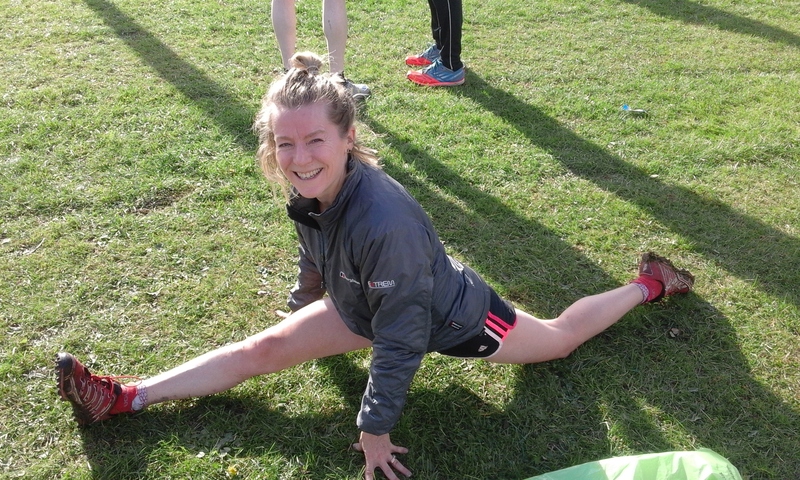 ), followed by Becki Law (39th), Ellie Salisbury (56th), birthday girl Hayley Turner (67th), and Maggie Oliver (3rd W65 and 99th). Brilliant effort everyone! In the second race of the day with nearly 200 runners, we had a fantastic turn-out for the men too – well done all! Matt Fortes ran a brilliant race overtaking as he went along to come in 19th overall, with strong runs also from Hugh O’donnel (37th), Arwel Lewis (83rd overall and 2nd M55), Anthony Bethell (great to see back, wins the prize for longest journey of 1.5h and in 95th), Gary Porter-Jones (118th), Eurwyn Edwards (166th) and the XC stalwart Steve Lloyd Jones (178th). Senior men are currently 5th, with the vets in 11th. Senior ladies are currently 2nd, with the vets in 2nd place too. Brilliant start for the season – also bearing in mind it was an ‘away’ fixture, the relays were on and the marathon is coming up! 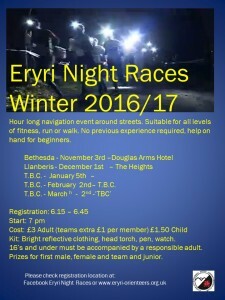 It’s the first race of the cross country season this Saturday – ALL first claim Eryri Harriers welcome. 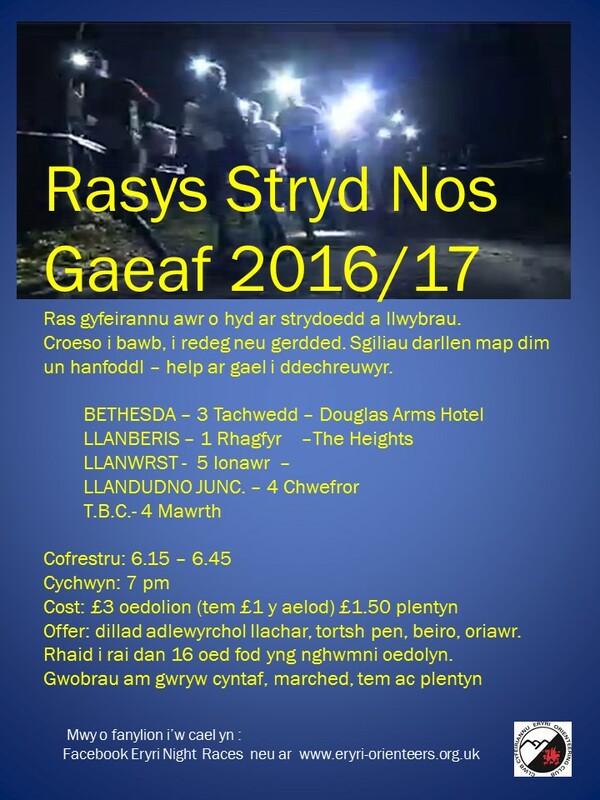 Please come along, its free of charge, a good run, a change from running on the roads or fells and either way, a great opportunity to take part in this fantastic team event – no need to enter, just bring your Eryri vest! Details: Mold Alun High School, Mold (CH7 1EP), all women sections plus Under 17 Men and Over 70 Men at 2.00pm (approx. 5k) with the Under 20 Men, Senior Men and all Male Masters, 40-69, to follow at 2.45pm (approx. 10k). A reminder also of the junior league – second race is also this saturday in Mold too, registration from 9.30am with first race at 10.30am. 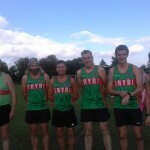 Please see North Wales Cross Country League website for more details and following fixtures:http://www.northwalesxc.com/ Minibuses for Shrewsbury and Oswestry fixtures. The first race of the Borders Road Running League 2016/17 season brought a record number of competitors to Caernarfon (318) to race on the 10km course along the Foryd on a glorious sunny day for the scenic route with very little wind. 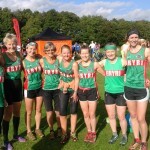 The Eryri Harriers made very good use of “Home” advantage with both their men’s and women’s teams winning their respective 2nd Division’s, the men by a 10 point margin and the women by 14 points. 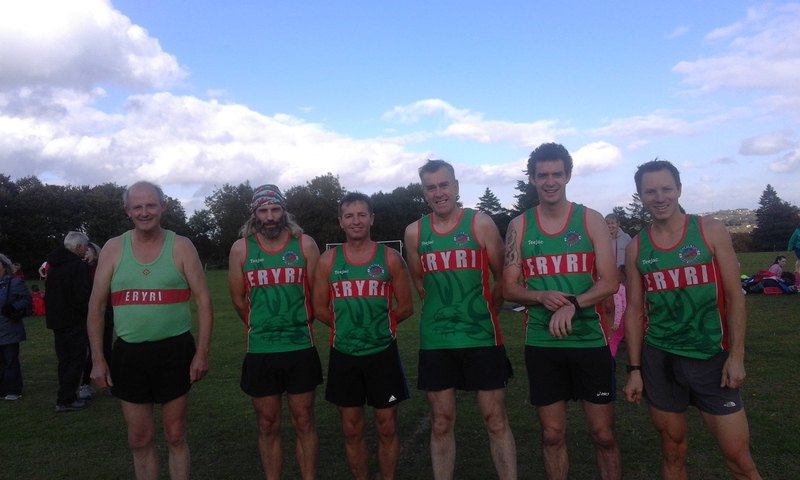 There were 17 Eryri Harriers competing led home by 11th placed Dewi Owen 35:39 followed by: 14th John Rowley 36:12. 41st Matt Fortes 37:51. 56th Steffan Williams 38:36. 74th Ali Chant 39:49. 96th (3rd MV/55) Arwel Lewis 41:00. 124th Gary Porter Jones 42:36. 145th Ashley Wager 43:44. 152nd (19th Female) Megan Hughes 44:01. 153rd Steffan Evans 44:07. 171st (25th Female) Helen Blair 45:10. 188th (31st Female) Becki Law 46.05. 197th (2nd MV/65) Malcolm Jones 46:35. 226th (1st MV/70) Emyr Davies 48:18. 255th Peter Lewis 49:47. 272nd (3rd MV/70) Don Williams 51:46 and 295th Alison Donnelly 55:31. The race was won by Phil Robertson 33:38 with the first female being Sarah Kearney in 65th place overall in a time of 39:12. Both members of the Wirral Athletics Club. A big Thank You to everyone who helped out on the day for making the event a huge success. The next race of the Borders Road Running League takes place at Upton, Chester on Sunday 6th November 2016. The Chester Spring 5 Mile race route. NOTE: Earlier than usual start of 10am for the event. Today saw the re-run of a race run in 1996. Formerly titled the Pedol Crafnant, the race, whilst thoroughly enjoyed by many was never re-run for a number of reasons. Twenty years later the race is reborn as the Trefriw Mill Race, and included in the WFRA North Wales Series. At 10.5 miles, and covering some testing terrain, the race was advertised as experience required. Fortunately runners were blessed with perfectly still and cool conditions which made it less arduous, but even so one or two still found to the route a bit tricky. The race covers exposed ridge, bog, rough descents and lakeside banks, before the final twisting paths back down to the village. Todays race was won by Miranda Grant of Eryri in 1.54.13 and Lloyd Taggart of Manx Fell Runners in 1.34.09, and both have set quality marks to be challenged in the future. The final race of the North Wales Series takes place on Sunday 23rd October at Clwydian Hills, Cilcain, after which the AGM will be held, all members are welcome.